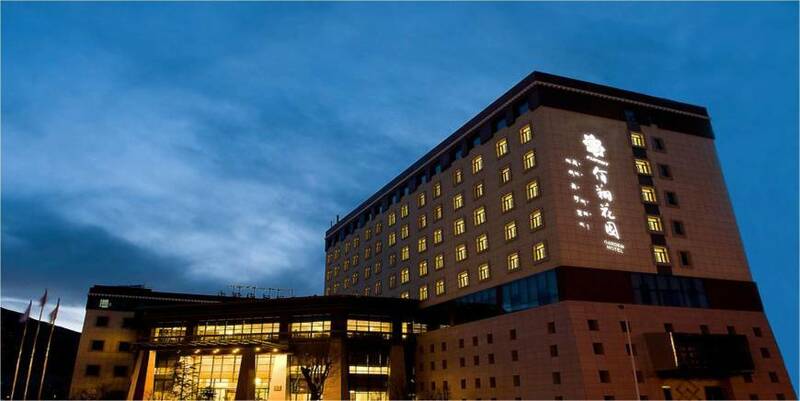 The Fliport Garden Hotel Lhasa (Lasa Konggang Huayuan Jiudian) is located in central Lhasa, only five minutes’ from the Lhasa railway station. With so many attractions in the beautiful Tibetan capital, guests could spend weeks wandering the Buddhist temples, appreciating the stunning plateau atmosphere and witnessing the unique culture of the locals. With a variety of public amenities and services, such as an airport pickup service, car rental, free parking, a free map of the area, Wi-Fi throughout the building, a free daily newspaper and ticket reservation, guests will find everything they need at hand and friendly staff ready to help. The on-site restaurant serves a range of delicacies for Chinese and Western palates and offers a chance to experience some of the local specialties, while a coffee shop serves an assortment of snacks and beverages. This hotel is well equipped to cater for business persons, with a business center, meeting rooms and a banquet hall available. The highlight of this hotel has to be the golf course and its extensive grounds. If playing golf at 3,650 is not your idea of fun, the hotel has a number of bars which are great for relaxing, meeting fellow travelers and swopping travel stories. - 53.1 km to Lhasa Gongga Airport.